SABRE’s Red Key Case Pepper Spray with Quick Release Key Ring now supports RAINN, the nation’s largest anti-sexual assault organization and one of “America’s Best Charities” according to Worth magazine. SABRE’s Red Key Case Pepper Spray with Quick Release Key Ring now supports RAINN, the nation’s largest anti-sexual assault organization and one of “America’s Best Charities” according to Worth magazine. As a result, users are able to protect themselves while taking a stand against sexual assault by helping fund RAINN’s National Sexual Assault Hotline. The popular key case model contains 25 bursts of police-strength pepper spray reaching up to 10 feet away. 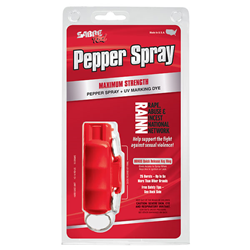 The RAINN pepper spray joins the red Personal Alarm with Key Ring in SABRE’s lineup of products benefiting RAINN. SABRE’s Personal Safety Academy - with over 500 instructors across the United States - also supports RAINN by donating a portion of course tuition to the nonprofit. In addition to monetary contributions, SABRE also supports RAINN by spreading awareness about sexual violence. The RAINN Key Case Pepper Spray with Quick Release Key Ring is available for $11.99 at http://www.sabrered.com. SABRE, the no. 1 pepper spray trusted by police and consumers worldwide, is family owned and operated with four decades of experience and is the leading brand in personal safety. The company’s law enforcement grade pepper sprays provide consumers with the same superior quality chosen exclusively by the New York Police Department, Los Angeles County Sheriff’s Department and law enforcement agencies worldwide. SABRE has trained 3,500 officers around the globe on the use of force and how to use pepper spray. SABRE also has a line of consumer personal alarms and home security systems, and is dedicated to educating its customers. SABRE’s Personal Safety Academy is available through certified instructors around the world to help teach personal safety skills to SABRE users. Learn more at http://www.sabrered.com, on Facebook at ‘SABRE-Security Equipment Corporation’, on Twitter @SabreRed or on Instagram @SabreSafety.